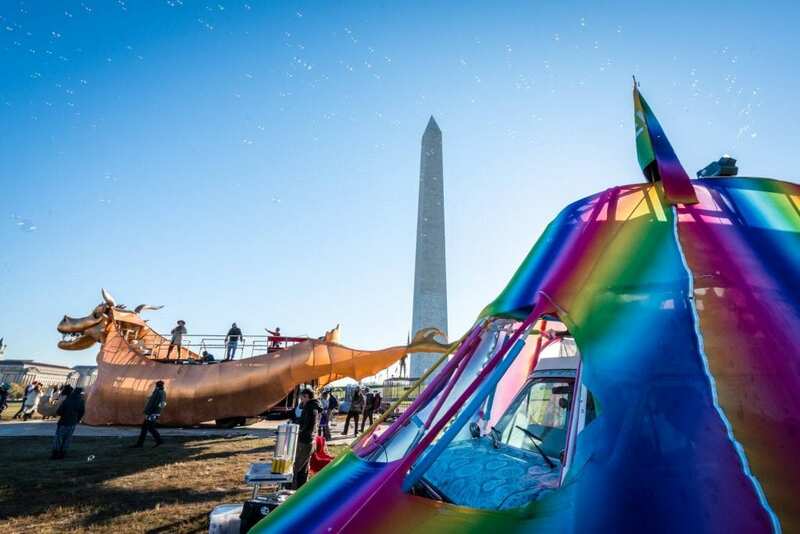 A three-day weekend event on the Mall in Washington DC featured a massive seven-headed dragon as an exaggerated symbol of Satan in what one prominent rabbi sees as part of the reappearing battle against paganism, an ancient sin that is creeping back into the world. The third annual Catharsis on the Mall, titled a Vigil for Healing, was held as a politically motivated incarnation of the desert Burning Man Festival from which it evolved. Catharsis, held from November 10-12, featured an array of art, music, lectures, interactive exhibits, meditation, healing and workshops. But unlike the Burning Man, held in an isolated desert location, the Washington gathering was politically oriented. “We sought a local experience that integrated the best of our … values with the immediate desire for political and cultural change that brings people to DC,” the organizers stated on their website. The event featured a 70-foot long seven headed red metal dragon on wheels. The dragon, named for the ancient Egyptian god Abraxas, was clearly intended to reference Satan as described in the Christian Book of Revelations. 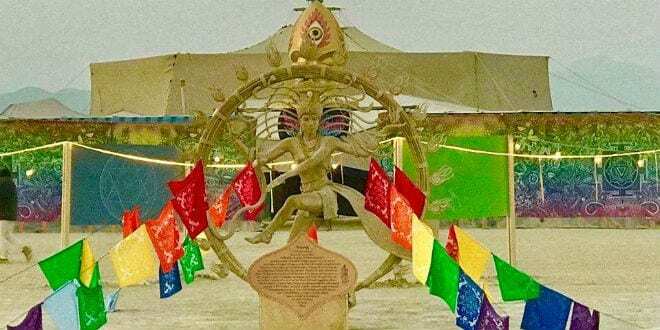 The dragon, like many elements of the event, was previously used at Burning Man, a yearly festival held in the Nevada desert that attracts tens of thousands from around the world. Other pagan elements of the event included a 30-foot tall “non-denominational” wooden temple that was built and then burned to the ground. At the focal point, directly facing the Washington Monument, was a paper-mache sculpture of “Lord Shiva Natarja”, a Hindu god described as “the cosmic ecstatic dancer”. Though these could all be regarded as cultural or artistic elements, the religious connotations were intentional. Rabbi Yosef Berger, the rabbi of King David’s Tomb on Mount Zion, stated that the event, with all of its intentions and accoutrements, was a lightly disguised pagan feast. He warned that this was part of a war against paganism being waged just as it was in the days of Elijah on Carmel. “Avodah Zarah is rising, make no mistake,”Rabbi Berger told Breaking Israel News. “Even secular Americans are turning to idols without really thinking about it. They can even say it is not serious or intentional, but it certainly is. Rabbi Berger emphasized that this was a warning sign, but also a reason to take heart. The event shared many elements associated with the Burning Man Festival held for one week every year in late August. 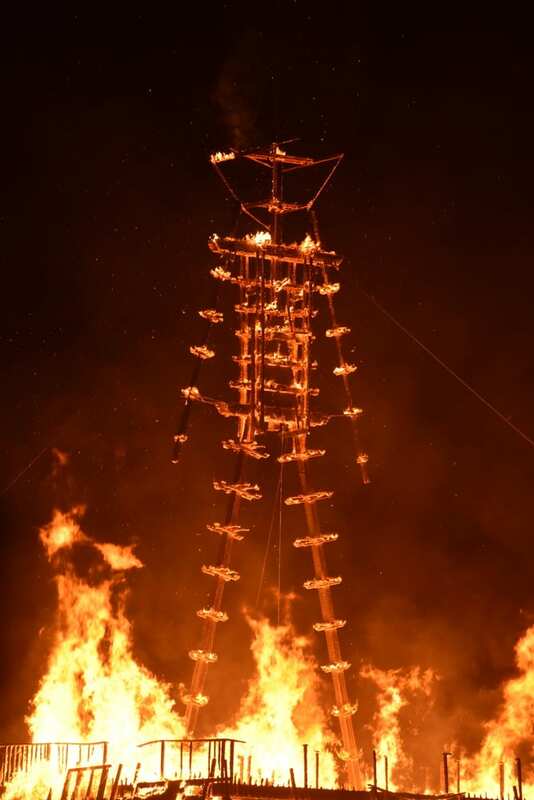 The Nevada festival attracted around 70,000 people this year, self-dubbed ‘Burners’, from around the world. The festival has a strongly spiritual basis with many alternative forms of worship being represented in micro-temples and altars. The week-long festival culminates in the eponymous ceremony in which a large wooden effigy of a man is burned. This ceremony, referred to among Druids as the ‘wicker man’, is almost universal amongst pagan cults and evolved as a replacement for human sacrifice. Rabbi Yoel Schwartz, a member of the nascent Sanhedrin, said that both events were clearly cases of avoda zara (paganism) forbidden to Jews. Controversy surrounded Catharsis on the Mall even in the planning stages. Organizers were issued a permit to erect a 45-foot tall, 16,000 pound, steel sculpture of a naked woman titled “R-evolution” in front of the Washington Monument, deliberately facing the White House. The organizers initially intended for the massive piece to stand for four months but the permit was later revoked by the National Parks Service on the grounds that the crane required to erect the statue might damage the grass and concrete in the Mall.